The NRC Whitewater Weekend gives kids a chance to sample freestyle, slalom, and wildwater, build whitewater skills and make friends with other young paddlers. Participants are encouraged to challenge themselves to develop and use new skills in a fun, supportive environment. Parents are encouraged to paddle with group, and off-the water activities get non-paddler family-members involved as well. Skills: Participants build key river-running skills such as balance, stroke technique, surfing, speed and stroke drills. Slalom: Slalom gates and technique are used both as a learning tool for building precision whitewater skills and as a fun, competitive aspect of kayaking. Wildwater: Participants learn to pick a fast line through a rapid, and navigate around obstacles without losing speed or veering off-course. Also, try out one of those crazy wildwater boats! Prerequisites: Must have prior paddling experience, including a confident wet-exit. Willing to try new things in flat and moving water. A whitewater roll is a plus but is not required. Not included: Lodging, food, and Sunday’s race entry are not included in the registration fee. If your child needs to borrow equipment, please email NantahalaRacingClub@gmail.com to inquire. 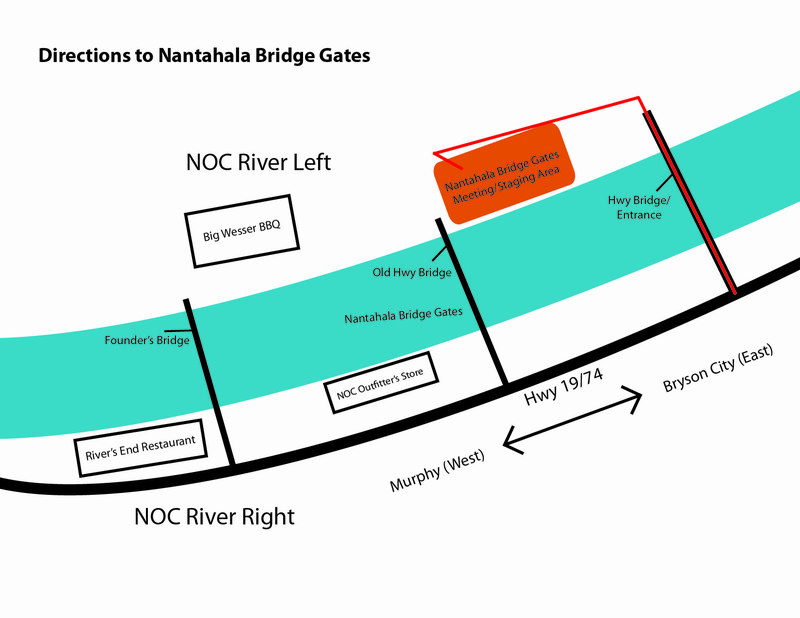 Nantahala Bridge Gates – The Nantahala Bridge Gates are located on the NOC campus. Directly after crossing the bridge onto NOC property River Left, turn left towards the main parking lot, then left again into the small parking lot just upstream of the roadbridge. This is the meeting/staging area. Click for PDF Directions.